Irish designer and model Jasmine Guinness sure knows how to pick good pieces for her basic wardrobe. The brunette styled two outfits recently with a lovely black blazer, the same piece imparting a different feel to each of her ensembles. Let’s take a closer look. Here she is arriving for the Royal Academy of Arts Summer Party 2013 in London on June 6 in delectable pink skinny jeans and a newspaper print knotted white shirt. She accessorized the look with black ankle-strap heels, a snakeskin clutch, a diamond necklace, dainty danglers and a black blazer. That last is what we’re most interested in. 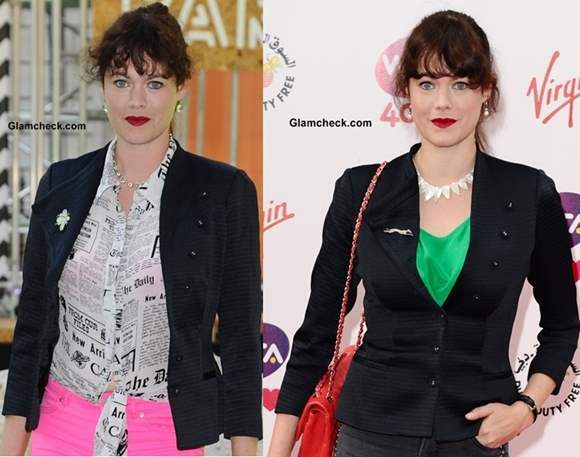 She wore the same blazer with another outfit as she arrived for the WTA Pre-Wimbledon Party 2013 at the Kensington Roof Gardens in London on June 20. This time around, she paired studded cropped denims with a gorgeous emerald green top which was mostly hidden under the same blazer, buttoned up. A red handbag, black patent pumps and a statement necklace completed the look. That blazer is one heck of a versatile piece. Firstly, it has a subtle texture, thus making it stand apart from the spate of plain black blazers. Secondly, it has a lapel only on one side which Jasmine has cleverly accentuated with a different brooch in each ensemble. The lack of a lapel on the other side makes for a much cleaner line on the outfit. There’s no extra fabric, it fits well, and looks amazing whether left open or buttoned up. What’s more, it actually blends in well with each ensemble, no mean feat since one is more fun and casual while the other has a formal streak. A black blazer is undoubtedly one of the most basic things you can buy for your wardrobe, and one that you will end up wearing again and again and again if you buy a good one that has that versatile spark. We love Jasmine’s choice for that reason alone. Take a page out of the designer’s book. She obviously knows what she’s doing! Don’t be afraid to wear a black blazer with your more colorful ensembles. It will not take away from the fun of your look and will only help to streamline it. As for your formal looks, nothing spells respectability, style and confidence like a well-fitting, smart black blazer. Instead of going with a plain black blazer, wait awhile and look around for one that has some character. Something a little offbeat will also work in the long run especially if you are an offbeat dresser yourself and, honestly, even if you’re not. A black blazer does not have to mean conformity or uniformity or all those other boring qualities that are usually associated with the piece. As Jasmine proves with both her ensembles, it can be anything you want it to be.